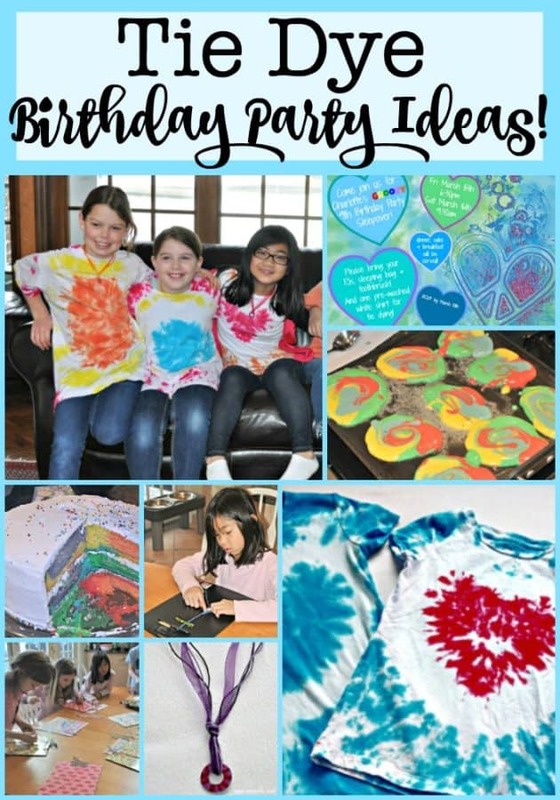 Tie Dye Party: A Great 9 Year Old Birthday Party Idea! 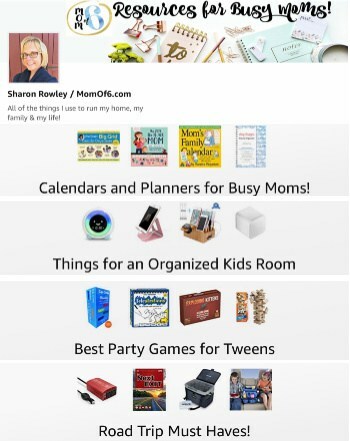 I love to throw kids birthday parties at home, and I always try to plan the crafts and activities around a theme. 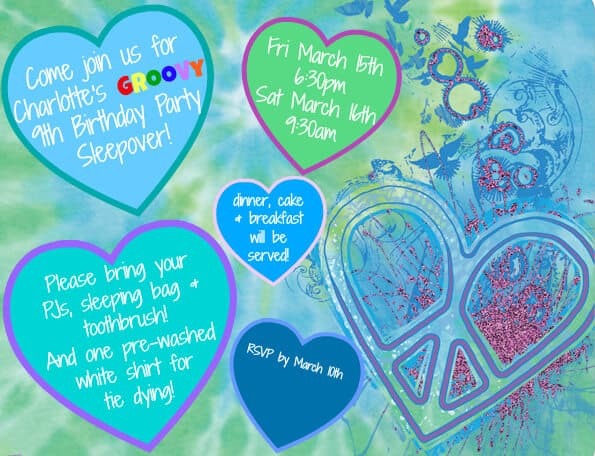 My daughter loves everything to do with jewelry and crafting, so I thought it would be fun to throw her a “groovy” tie dye party to celebrate her 9th birthday- and she loved it! The guests arrived and the birthday girl, along with her sibling helpers, stashed away their sleeping bags and backpacks for later. Gifts were placed on the dining room table (to be opened after the party), and we collected the white tee-shirts that everyone brought for tie dying (I asked the guests to bring along their own so that I wouldn't have to guess at sizes) and placed the tees to soak in the bucket of soda-ash. 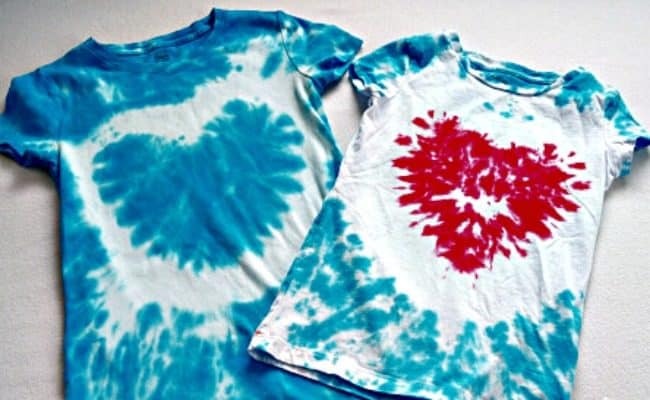 (see the video below for tie dye instructions). Dinner! For this party, we set up a pasta and salad bar. Guests chose the type of pasta they wanted (penne or linguine) and could top their pasta with sauce, meatballs and a side of garlic bread. They also could assemble their own salads. Time to tie-dye our shirts! 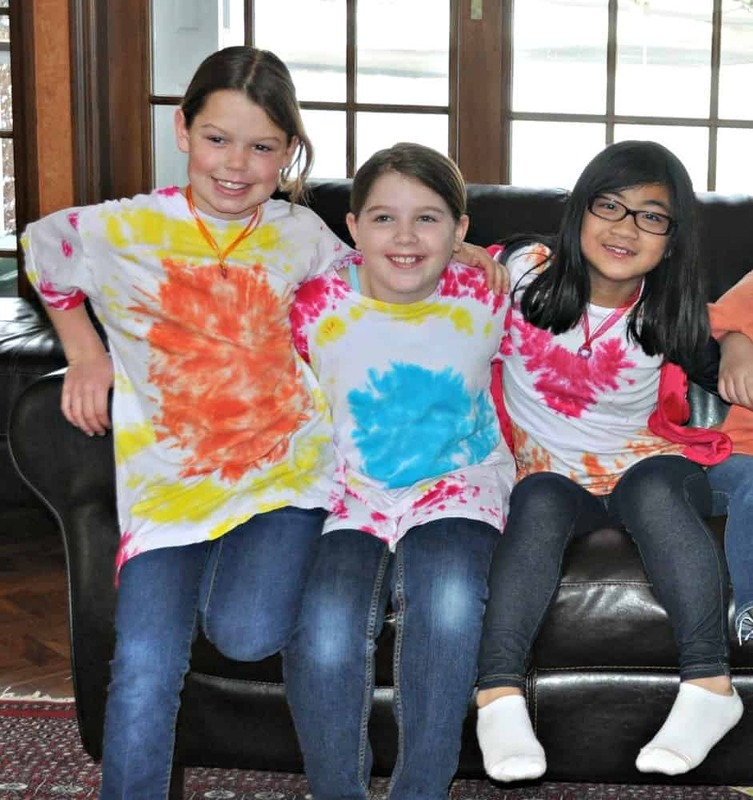 Buy one or two tie-dye kits– you'll get everything you need- the soda ash (to pre-soak the tees, so the die takes), the rubber bands for tying the designs, and the colors and squirt bottles. Set out several plastic dish tubs on the table for the kids to die their tees over. Ideally- have one tub per color of dye that you are using, and treat them as “stations”. So the kids will move their tees from color to color as they add the dye. Cover your table with a plastic table roll to protect it from the dye. Make sure that you use 100% cotton t-shirts. Have a few extra on hand just in case a guest forgets to bring one! After dying, I put each tee into its own plastic grocery bag, so the colors wouldn't touch each other, and allowed them to sit overnight. The next morning when I woke up, before starting breakfast, I rinsed the shirts until most of the dye was out, cut off or unwrapped the rubber bands and then washed and dried all of the tees in our washer and dryer. They are now “set” and can be washed with a regular load of clothes. Start the washer necklace project! 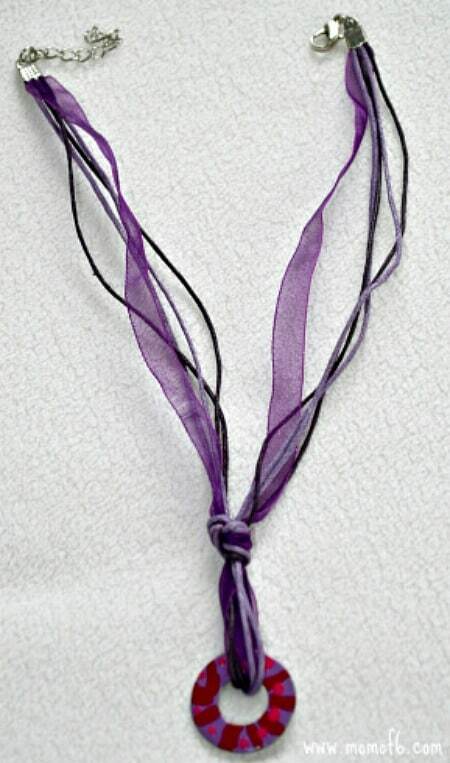 I found this great idea online at Captain Crafty for making pendants from washers and decorating them with nail polish, and then we hung the embellished pendants on ribbon necklaces . To start the project, they painted their “base color” on their washer, and then allowed that to dry as we played games. Time for “Just Dance” on the Wii– this game never gets old! The girls elected to take turns picking songs from Just Dance, and then one of the girls selected a Just Sweat cheerleader workout that had them all dancing and giggling and having a blast! Changed into jammies and got the sleeping bags set up. Time for a movie and popcorn! As an earlier birthday gift, we gave Charlotte two new movies so the girls could select one for the party. They finally settled down to sleep about an hour later- and were still all sleeping at 7:30 am the next morning! When the girls woke up, we started our friendship bracelet craft, which they continued to work on while watching the second movie. This gave Steve and I time to prepare platters of bacon and tie-dye pancakes! 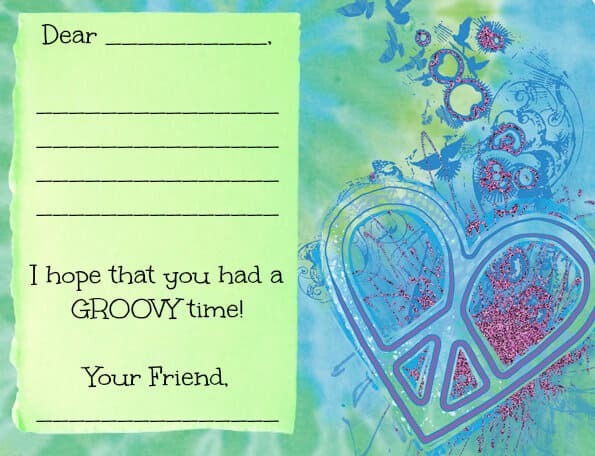 Want to get the free Tie Dye Party Printables? 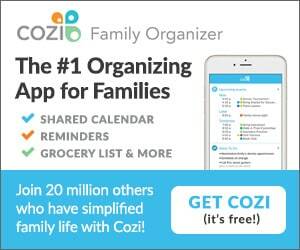 We all had such a fun time at this birthday party- and we bet that you will too! 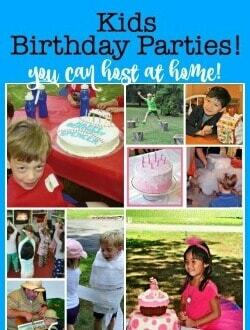 This is absolutely adorable and how completely ironic … my daughter CHARLOTTE is turning 9 and we cam across this party idea browsing through Pinterest! Needless to say …we HAVE to do it! I did right click and save to my computer, but it will not allow me to edit the document? Is there a way to do this? I’m sorry to bother you … but it is so cute! Any suggestions you can offer would be great! Is it possible to get the original image for the invitation so I can modify it…it is so cute! You can download the image right from this post. Just right click to open it and then save it to your computer! I tried, but when I go to print, it is blurry b/c the resolution is for the web. It’s right there in the post… we did tie dye cakes and cupcakes. I’m doing a tie dye party for my daughter but I have NO idea how to use PicMonkey! 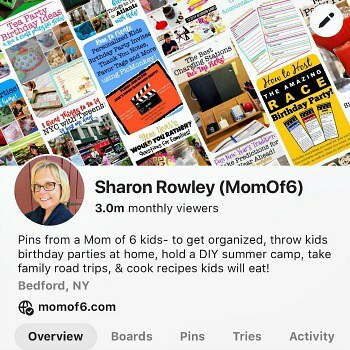 Can you send me a link to this invite? I love this! 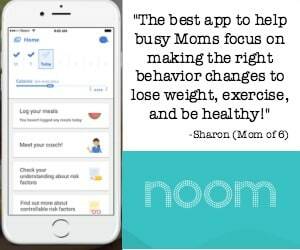 I am a mom of 5 so I appreciate the insight! Just had a tye dye sleepover for my 8 year old!! It was a blast . Thanks for your helpful hints! 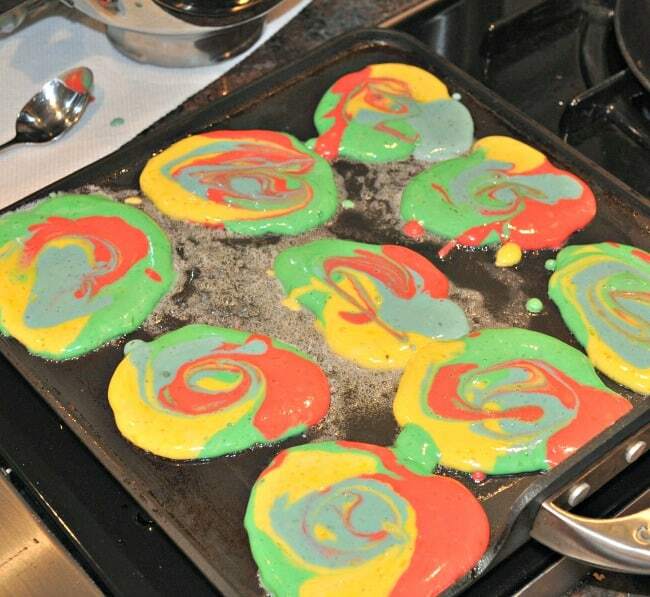 I LOVE the tye dyed cake and pancakes. 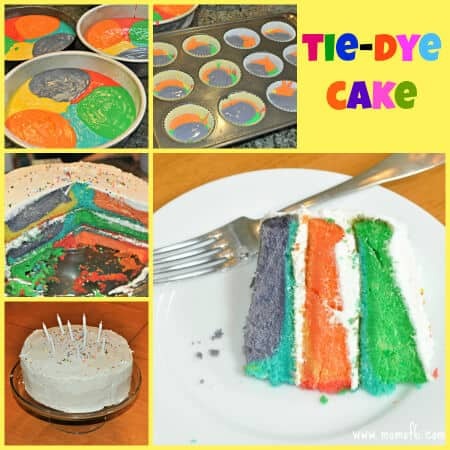 I am assuming you just used food coloring to get the different colors. Is there anything else to it?? Thanks for sharing. The real trick is adding some yogurt to your cake mix. The acid in the yogurt is what allows the colors to become more vibrant!